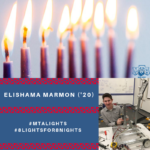 Today’s MTA Chanukah Light is Junior, Elishama Marmon. In addition to his role on our award-winning Robotics Team, Elishama participates in Night Seder, takes advantage of the unique opportunity to enroll in college courses at Yeshiva University, and is an active member of many clubs, including the Debate Team, Outdoors Club, Math Team, Swim Team, Softball Team, and Sports Management Club. “I work on the hardware side of our Robotics Team, the Lionotics, where I build the physical components of the robot and design the various parts that perform competitive tasks. Last year, our robots moved up through multiple rounds of qualifiers and won the FIRST Tech Challenge New York Championship against dozens of other schools and institutions and advanced further than any other yeshiva high school team ever has. I enjoy working collaboratively with older students and learning from them, as well as teaching younger students what I have learned. The creative opportunities are unlimited and it’s incredibly rewarding to watch the components I built in action. I learned that with hard work, anything can be accomplished. Over the summer, I had the amazing opportunity to serve as an intern in the Yeshiva University Biology Lab. I worked under the guidance of MTA Chemistry Instructor and YU Professor Mr. Chaim Goldberg and YU Biology Department Chair Professor Sumanta Goswami, along with two Yeshiva College students. Through our research, we attempted to understand whether there is a mutation of the LRP6 gene in certain cancer cell lines to which anti-LRP6 antibodies had shown a lower binding affinity than in normal human cells. This could be useful in certain cancer types that require the LRP6 protein to encourage cell reproduction. I learned and executed exciting techniques, including Reverse Transcription, Gel Electrophoresis, and preparation of DNA for sequencing. The summer research project was a great way for me to explore my interest in Biology and research right here on campus and gave me valuable insight into what a career in the Sciences entails. While I am passionate about Science and technology, the most important thing I have learned at MTA is to always prioritize Torah in my everyday life. Whatever else is happening, no matter what I am doing, it is always important to make time to learn Torah.” Thank you, Elishama, for being a guiding light in our community.